Halloween is my second favourite holiday - closely following Christmas. I love the chance to dress up and decorate and, having grown up with all the brilliant Halloween films of the nineties (hello, Practical Magic), it's definitely a time of nostalgia for me. However, I'm not into all plastic mock-horror tat that we buy at the pound store and throw away the next day - I love to really make an effort. 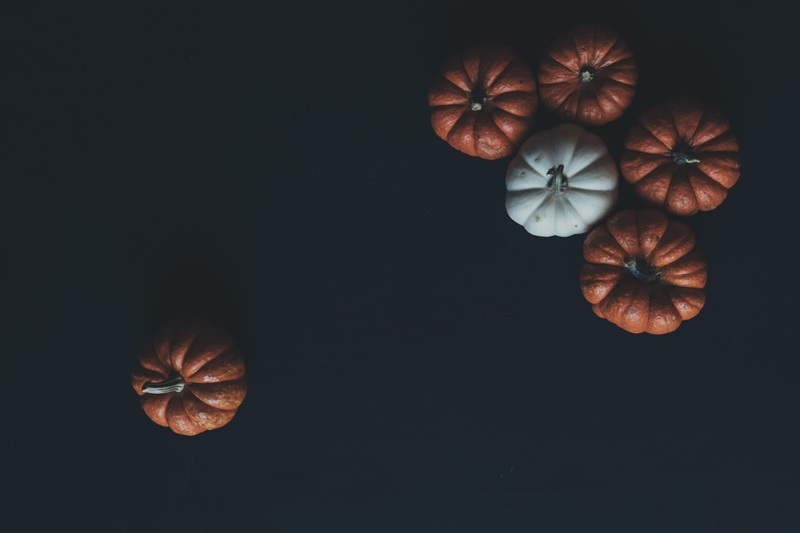 And I know some of you who read this blog share my love of (for lack of a better word) 'classy' Halloween decor, so here are a few ideas I've collected from the wonderful world of home decor websites and put together just for you. All images are credited with a source, so please go check them out for more ideas! 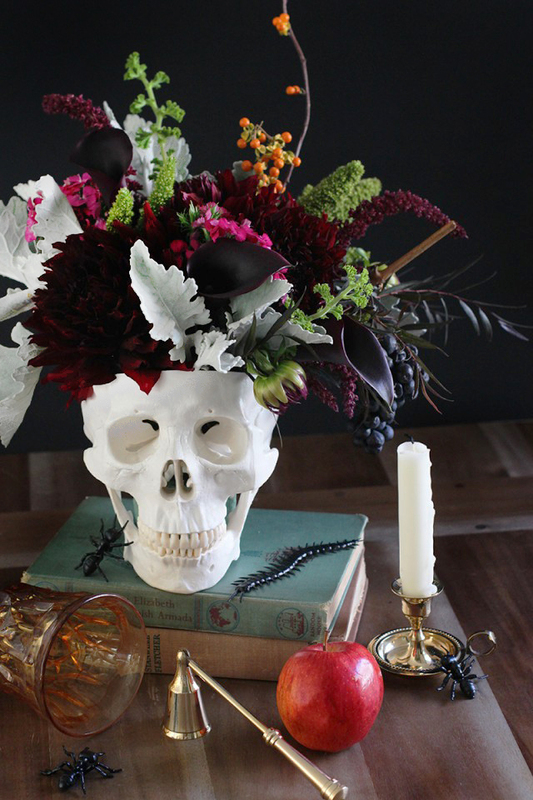 Honestly Yum has put together this fantastic DIY using a model skull and fresh flowers. It looks like something that belongs in a Vanitas painting - morbid but beautiful. Don't worry - these aren't real insects. 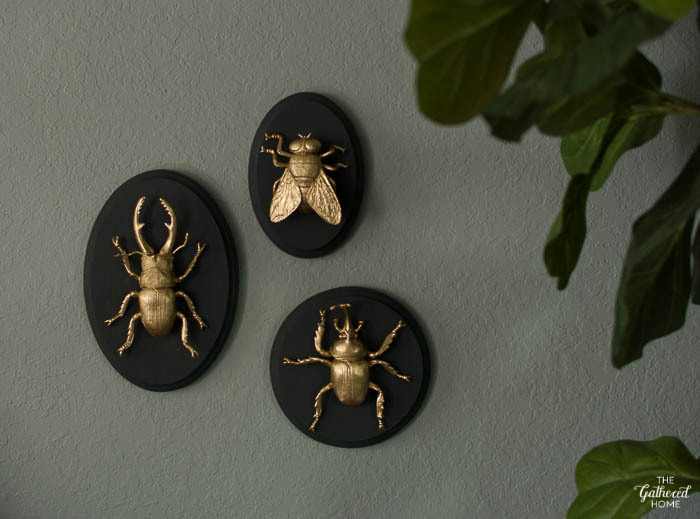 You can recreate this DIY from The Gathered Home by using giant plastic insects, liquid gold leaf and wooden plaques for a classy creepy crawley wall display that will trump any boring old painting. What's a party without bunting? 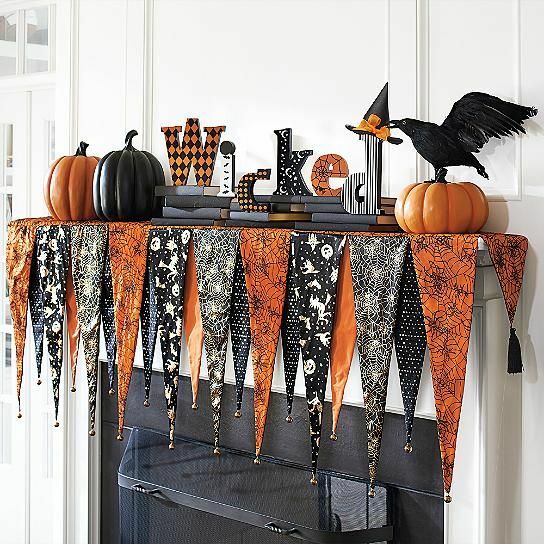 If you're having a Halloween get-together this year, try making some super easy no-sew bunting with alternating orange, black and white shades with this tutorial from Staying Close To Home. Got a porch? 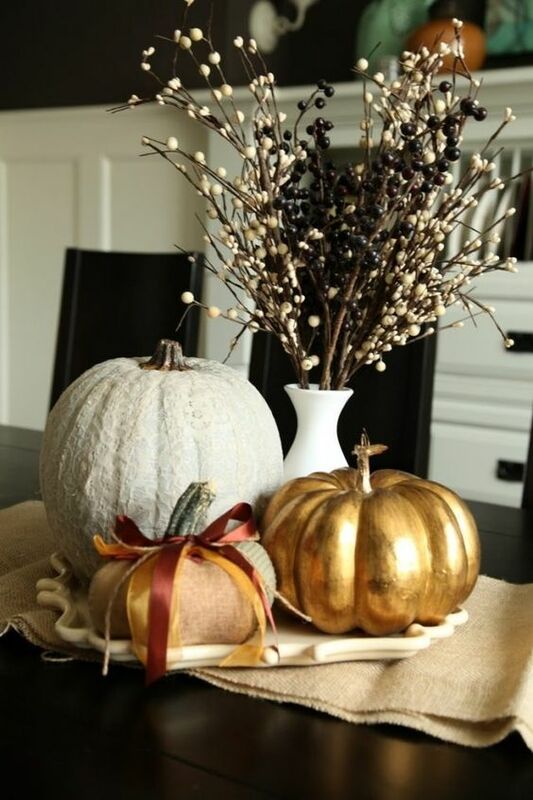 Then this foolproof decor idea is for you. Simply take a couple of long branches, remove any leaves, then prop them up against the side of your house. 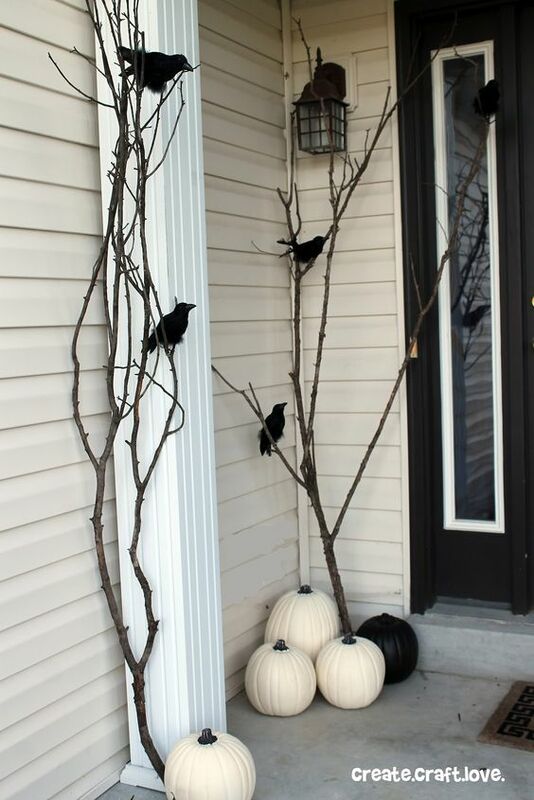 Find some faux ravens á la Create Craft Love, and finally decorate with some pumpkins! Wreaths aren't just for Christmas. They look positively enchanting with a Halloween theme. 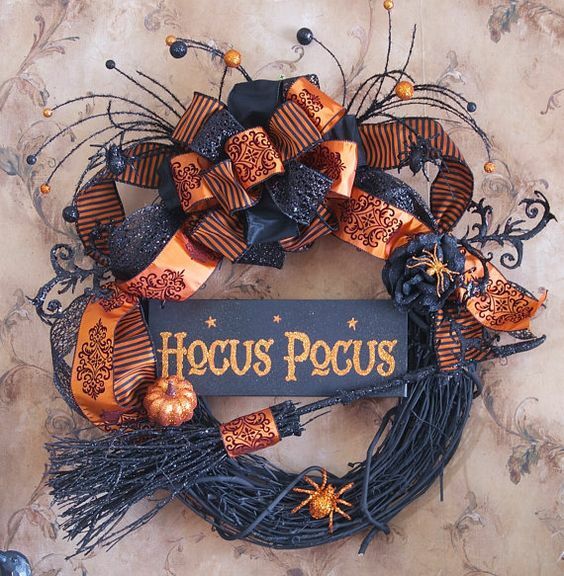 Etsy shop SignsStuffnThings has some amazing wreaths for this time of year, inlcuding the one above. 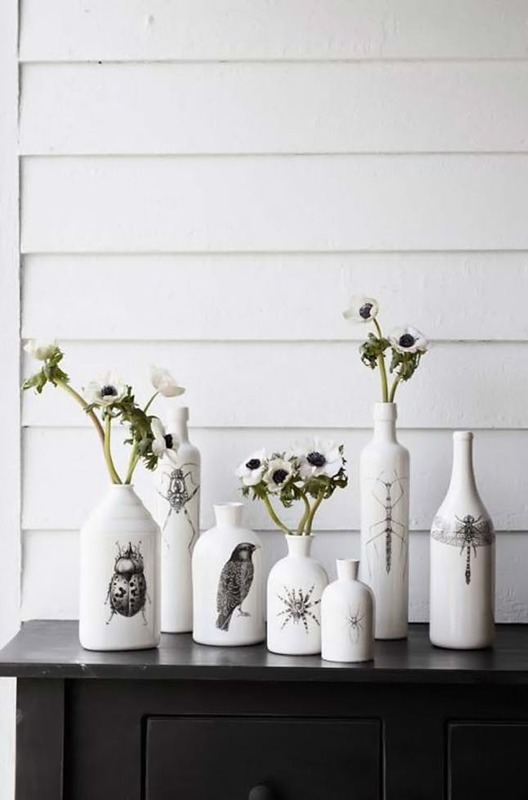 Artist Laura Zindel creates white bottles featuring beautiful nature-themed illustrations, reminding me of 'wet specimins' (insects in fluid solutions) in an old abandoned laboratory. The ones with the spiders on the front are my favourites. You really can't go wrong with a pumpkin (unless you're this person). They epitomise Halloween, and look fun as they are, or with an interesting carving - OR painted gold with ribbons around the stem, like these ones from Decor & Style.